Are you feeling pain in your neck, shoulders and back? Maybe you’re just feeling exhausted, stressed, anxious, sad, angry, and frustrated? If so, you are going to want to watch this video. This morning after writing up a video for Sherry Zak Morris’ Yoga JP channel called Hatha Yoga for Self Care I shifted gears to think about creating a video for this channel. I wanted to do something on tips for self care, or why self care is important. As I was standing at my computer I noticed my brain was getting fuzzy, I could feel the tension mounting in my neck, shoulders and low back and so I went and laid down on my yoga mat. This one pose has become my go-to for self-care. I lie down, I feel the support of the earth underneath me and I surrender to gravity and I let the tension melt into the earth. Sometimes I lie there for 30 minutes, sometimes I lie there for five or ten minutes. But afterwards I get up and I feel refreshed and restored, the tension is gone, the stress has left my body, the pain from my shoulders, neck and back has magically disappeared and all I did was lie down. This is a pose that I am putting at the center of my life, practice, self-care and teaching more and more. Lying down, feeling the support of the earth underneath me, letting go of physical, mental, and emotional tension offers a huge boost to my physical, mental and emotional well-being. It leaves me feeling healthy, relaxed and ready to take on my work and personal responsibilities. So the next time you are feeling overwhelmed, anxious, stressed out and physical tension mounting in your body, why not give it a try? Lie down! It is that simple! If you have low back issues, lie down with your knees bent and your feet flat on the floor or place a bolster underneath your knees. If this video was helpful for you, please give it a thumbs up. 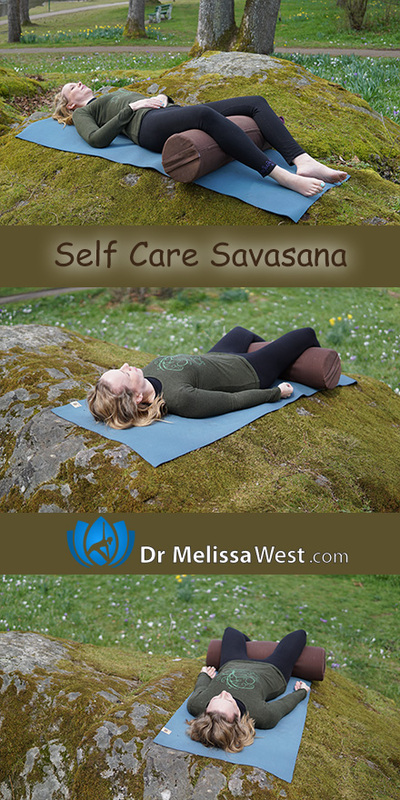 Let me know in the comments what your favourite yoga pose is for self care. And if you would like a full-length hatha yoga class for self care then be sure to check out Sherry Zak Morris’ channel Yoga JP on Friday April 7th, 2017.